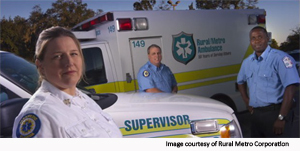 Rural/Metro Corporation is a national leader in private ambulance and fire protection services in 20 states and more than 450 communities nationwide. Their EMS professionals provide more than 1.3 million 911 ambulance transports annually, and their firefighters respond to more than 60,000 calls for assistance each year. In late 2010, Rural Metro embarked on a corporate business intelligence initiative to ensure that important operational, billing, and financial data was delivered to key personnel and management simply and efficiently. The data came from a variety of different applications and data sources, including manual spreadsheets, and needed to be consolidated into meaningful performance indicators and delivered to both the corporate SharePoint portal and as an in-line email to a number of different mobile devices including iPhones, iPads and Blackberries. Using SAP BusinessObjects Data Integrator, Rural/Metro was able to effectively extract, transform, and load the relevant data into two Data Marts. For the SharePoint delivery and viewing, Xcelsius data visualization was selected to provide a dynamically interactive and intuitive interface for the user. In order to display multiple metrics for multiple regions, Rural/Metro employed the XML Data Caching capability of InfoBurst®, which enabled all the data needed to be held in cache and then selected on demand through the Xcelsius dashboard. Delivering information to the different mobile devices as an in-line email presented some interesting challenges. The resolution and rendering capabilities on the different devices was not consistent, so what looked good on one device was not easily viewed on another. This was primarily due to the HTML being interpreted differently by the various mobile devices. Rural/Metro overcame this issue through a unique feature in InfoBurst® that allows email output to be rendered as a PNG picture with a parameter that is able to define the best resolution for each type of device on which it will be rendered upon. InfoBurst® automatically schedules and bursts Web Intelligence reports against the Data Marts, transforms them into PNG format as separate in-line emails, and then pushes them out to the appropriate user’s mobile device. Rural/Metro cleverly designed the look and feel of the Xcelsius dashboard through SharePoint to match that of the PNG in-line emails so that both the interfaces would be consistent and logical, making sense to the supervisors and managers that use it. InfoSol’s solution brought immediate benefits. 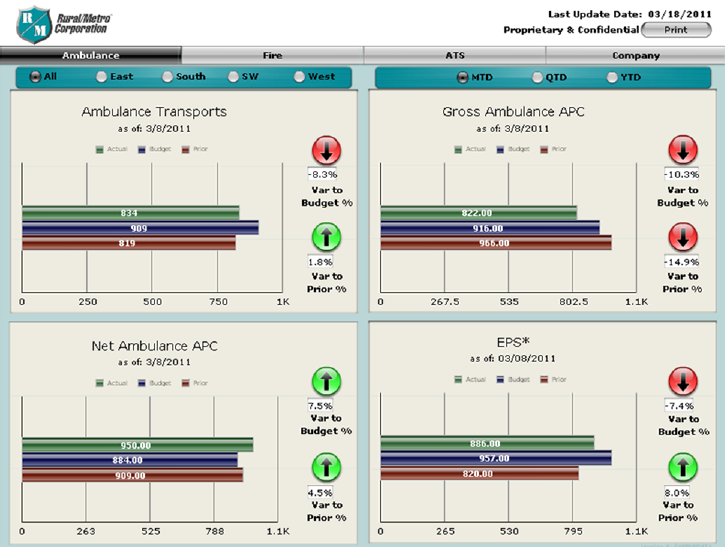 For the first time, managers were able to view key, up-to-date business metrics on a daily basis. This allowed them to use comparison metrics to standardize operations and promote best practices. They were also able to identify and respond to potential issues more efficiently and effectively. Most notably, the new solution provided a uniform method of communication across the business. 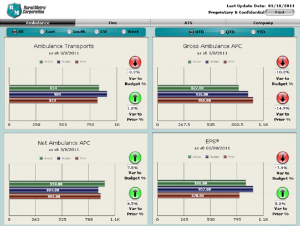 Rural/Metro is planning to enhance the solution further by adding more metrics, and looking to deliver interactive Xcelsius dashboards on the mobile devices.